I have been taking the local commuter bus Valley Mover for 2+ years now and have found an extra 2 hours a day to sew. This afternoon’s project was the 1″ scale version of my Gwendolyn’s dress. Gwen is 12″ tall and by Gwen Ross of Mystic Mold. 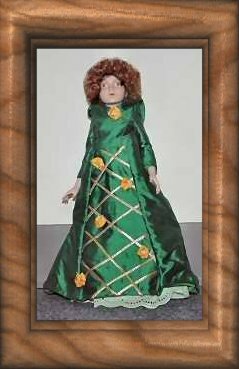 I met Gwen Ross at the 1995 Anaheim Doll Show when I won 3rd place for costuming for Letha Marie another doll by her who is 46″ tall. Sadly Gwen Ross is no long with us but I am lucky to have 2 of her dolls. I will be recreating Letha’s gown in miniature soon as well. When I have more done on the dress I will post photos! The lesson in all this is to take the bus to relax and craft each day! It does not matter where you live… check into your local bus! Tagged Doll Patterns, porcelain dolls, sewing. « What dolls do you sew for?